Sea food recipe from Kerala are really Divine cooked with the blend of coconut and spices. My favourite one is the prawn curry. I learnt this from a friend of mine as I wanted to make it the authentic way. This can be served with plain rice or dosas an appams. Ginger garlic paste .... 1 tbsp. Fenugreek seeds/methi seeds .... 1 tsp. Black pepper seeds ............ 1 tbsp. Coriander seeds ......... 1 tsp. Turmeric powder .......... 1/4 tsp. Mustard seeds ............ 1 tbsp. Tamarind juice .......... 2-3 tbsp. 1. Clean the prawns and marinate them with salt and turmeric powder. 2. Heat a table spoon of oil roast methi seeds, black pepper, red chillies and coriander seeds. Add the grated coconut and one sliced onion, keep stirring till the colour changes. Add turmeric powder. Grind this masala adding a little water and set aside. 3.Heat a little oil in a pan and crackle the mustard seeds. Add the curry leaves and the remaining sliced onion, slit green chillies and saute a little. Add the ginger garlic paste, tomato and prawns. Keep stirring till the prawns change the colour and all the water is dried up. 4. Now stir in the ground masala paste and the tamarind juice and salt. Add sufficient water to cook and simmer for 10-15 minutes. Garnish with coriander leaves. This dish goes well with plain rice, dosas and appams. If you like it less spicy you can reduce the quantity of peppers. 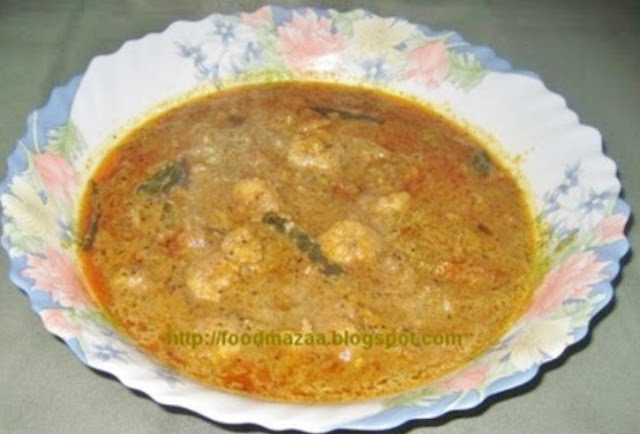 Fingerlicking prawn curry..am hungry now.. Delicious prawn curry..great pictorials too! Do drop by my space sometime. hanks Aipi for liking my blog. I had a quick glance of your blog..quite liked the idea of bookmarked recipes event.I shall leisurely see all your recipes later and will definitely send in my recipes for the event too. Must try this out as we have stocked a lot of prawns in the freezer.